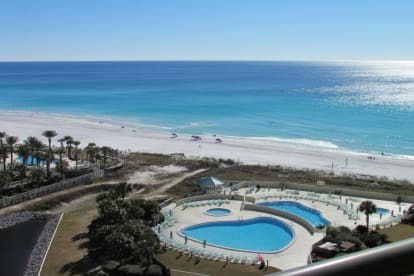 We have owned and rented property in the Miramar Beach area since 2002. We love the area and treasure making beach memories with our friends and family. We have spent 14 Thanksgivings here (family tradition), attended weddings and taken thousands of sunset photos. It is a blessing to now be sharing the beach with our grandchildren. Recently retired, we decided to begin a new adventure at Edgewater with Unit 1304 in 2017 and now in 2018 have added Unit 808 to our family. 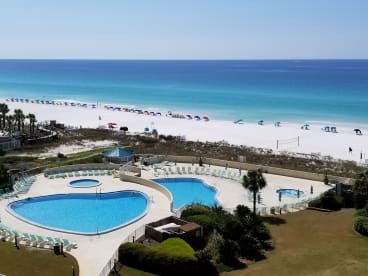 We like the fact that Edgewater is right on the sand, is well maintained, has a true resort feel and the VIEWS are amazing!!! The greenspace and playground are perfect places for kids to play and the pool area is so beautiful. Two pools, hot tub, kiddie pool and just a short few steps to the sand from the pool deck. The management staff is top notch and the property feels like the perfect place to spend our vacation. We hope to be able to share our home with not only previous guests who have become family, but also with new guests who will come stay with us again and again. The first time we walked into this unit we felt at home. The east facing balconies makes morning coffee a pleasant way to start the day and provide shade from the hot afternoon sun. We spend most of our time on the beach or the balcony. We also love the fact that you can sit in bed (master bedrooms) and enjoy the beautiful water view. The units are quiet, peaceful and relaxing... the perfect place for a getaway.